If you are looking for information on the Drive Medical Elevated Raised Toilet Seat With Removable Arms you are in the right place. 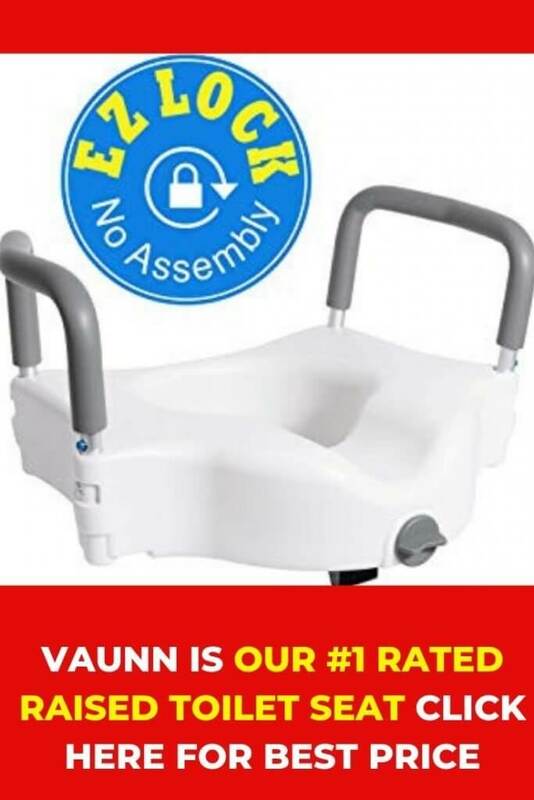 We are going to give you a full overview of this toilet seat riser and explain what the features are, what the customer opinion is, where to get the best deals and discounts and most important whether or not it does a decent job. We will also point you in the right direction where we would recommend purchasing from so you get a good raised toilet seat that you will love and that will do the job. Before we get into the Drive Medical Premium Seat Riser with Removable Arms for Standard Toilets review, you may be here and NOT looking to read a full review, you may just want to buy this toilet seat so if that is the case you can click link below to go straight through to Amazon right now. Whether you are looking for your 1st raised toilet seat or looking at changing the one that you have you will find the drive medical raised toilet seat elongated with removable arms is the perfect solution. It will add 5 inches to the height over a standard height toilet and seat so for individuals that may have any difficulty in sitting down and or standing up you will love these seats. The Drive Medical Elevated Raised Toilet Seat With Removable Arms is easy to clean and very easy to mount and install. The dimensions are 13.75 inches (Width) x 17 inches (Depth) x 3.5 inches (Height) and will fit most standard toilets as they measure 16.5 inches. No tools needed as well when the time comes to install. Being made of heavy-duty molded plastic construction making it lightweight, portable and easy to clean. Another good thing is if room space is a problem this seat can be used with or without the armrests. The seat does come with a limited lifetime warranty which is great for peace of mind. The other great thing about this raised toilet seat is can be used for the elderly and the disabled as it’s so versatile and safe of a seat to use and have. Installing the Drive Medical Elevated Raised Toilet Seat With Removable Arms is this easy. Remove your toilet seat and set it aside. Put arms on seat riser and place the riser on your toilet. Once you put the arms on you it will be easy to see which way the seat sits on your toilet. Place the standard seat back on top of the riser. Put the bolts through the holes on the toilet seat and through the riser using the new longer bolts. Screw on the wingnuts and tighten down as tight as you can get them from the BOTTOM of the bolts with the wingnuts then hold the wing nut in place from the bottom and continue tightening from the TOP using a screwdriver. So if you are looking for a great raised toilet seat then we think you have found it! The reviews of the Drive Medical Premium Seat Riser with Removable Arms for Standard Toilets are great for the most part. You will see 4 or 5-star reviews at Amazon.com which is great but there were a few reviews saying that the seat didn’t quite fit there toilet to well or was hard to get used to the height. If you are looking for an easy to install and comfortable portable raised toilet seat then you need to take a serious look at the Drive Medical Elevated Raised Toilet Seat. You will save money, get a fantastic toilet seat and you will get a VERY low cost for this product!